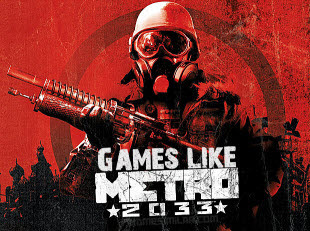 Games Like Metro 2033 '+g+"
Metro 2033 is a first-person shooter video game, which is based on the novel Metro 2033. It was developed by 4A Games in Ukraine and released in March 2010 for Microsoft Windows and Xbox 360.The game is played from the perspective of Artyom, the player-character. The story takes place in post-apocalyptic Moscow, mostly inside the metro system, but occasionally missions bring the player above-ground. If you are a fan of First-person shooter games like Metro 2033 and looking for more games with similar game play then find the recommendations for it below and don't forget to mention if we miss any games as we keep on updating this list. S.T.A.L.K.E.R. is a series of first-person shooter survival horror video games developed by Ukrainian video game developer GSC Game World for Microsoft Windows. The games are set in the area surrounding the Chernobyl accident site, called ‘The Zone’, in an alternative reality where a second explosion occurs at the Chernobyl Nuclear Power Plant some time after the first and causes strange changes in the area around it. Fallout 3 is an action role-playing open world video game developed by Bethesda Game Studios. It is the third major installment in the Fallout series. The game was released in North America, Europe and Australia in October 2008, and in Japan in December 2008 for Microsoft Windows, PlayStation 3 and Xbox 360. Rage is a first-person shooter video game developed by id Software. The game is set in a post-apocalyptic near future, following the impact of the asteroid 99942 Apophis on Earth. The game has been described as similar to the movie Mad Max 2 and to video games such as Fallout and Borderlands. Singularity is a first-person shooter with survival-horror elements developed by Raven Software and published by Activision and released for Microsoft Windows, PlayStation 3 and Xbox 360. The player take on the role of Captain Nathaniel Renkoa, an US Air Force pilot provided with an artifact known as the Time Manipulation Device (TMD) which can manipulate time. F.E.A.R. 2: Project Origin is a first-person shooter psychological horror video game, developed by Monolith Productions and published by Warner Bros. for Microsoft Windows, PlayStation 3 and Xbox 360. The F.E.A.R. 2 gameplay maintains the core elements from the original, including slo-mo combat, martial arts attacks, and enhanced A.I. Half-Life 2,....if you can think of more, then don't forget to mention it in comments.